Panel sizes are selected so that they can be placed between rafters with almost no waste (for attic insulation), and they are placed in combination, by length and by width, they fit almost all modular structure spans, with not waste or with a minumum of waste in cutting. Also, the panels can be manufactured in other thicknesses too, upon request. Then, the difference in thickness of Simprolit panels comes from a different thickness of the styrofoam inter-layer whose thickness in "SUP 3" is b=10 mm, in "SUP 5" it is b=30 mm, in "SUP 10" it is b=60 mm, in "SUP 10" it is b=80 mm, and in "SUP12", it is b=100 mm, and the whole thickness of Simprolit (patent-protected polystyrene-concrete) is 10 mm on each side. Simprolit panels have proved successful as suspended thermo-insulation ceilings, which may be plastered with a coat of about 3-5 mm, or may simply be skimmed and painted. Also, Simprolit panels are used in formworks as therm-insulation of concrete beams and columns which can be plastered immediately, with no additional armatures or plaster laths. 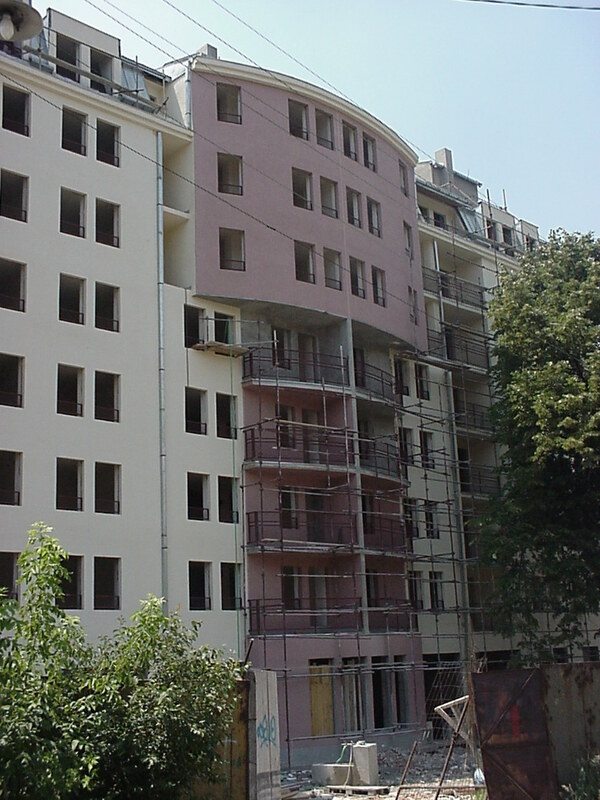 Unlike the existing facade insulation systems, where mineral wool or styrofoam panels are used (with subsequent application of special plaster over a special net, and finishing work at the end), the Simprolit panels produced by "SIMPRO" may be plaster coated with a simple cement plaster thick 3-5 mm, or only skimmed with a thicker layer, and can be ready for finishing as soon as they are fixed on the facade, and some of the finishing operations (grunt, skimming) can be partially carried out even before the panels are fixed. 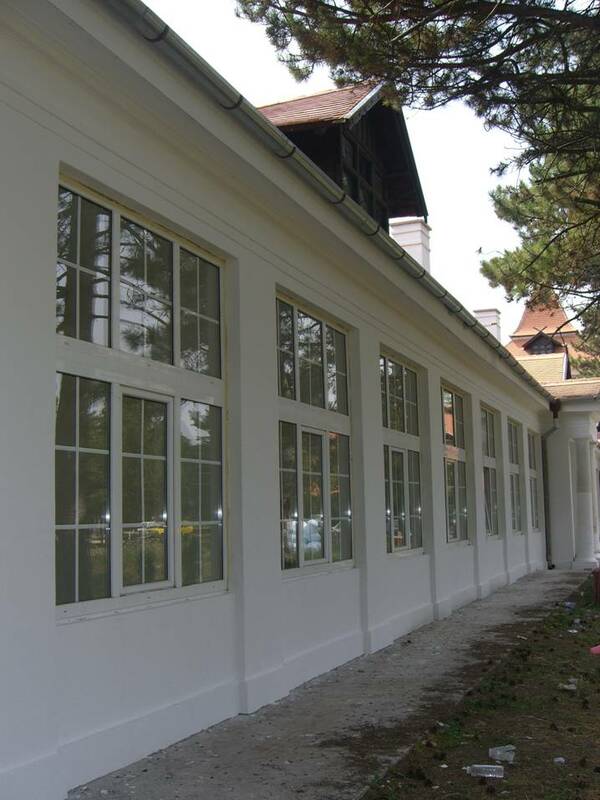 Simprolit panels can be fixed in any weather, as their production raw material contains a special additive which makes them resistant to capilary spreading of water, and which also considerably increases the life and exploitation characteristics not only of the facade, but of the structure as a whole. 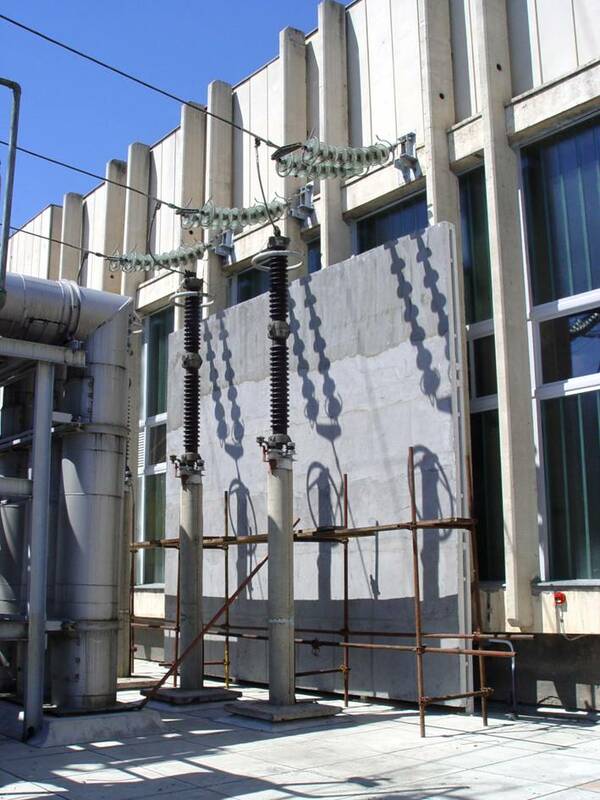 Simprolit panels are fixed on facade in traditional ways – using glue and plastic plugs at fixing stage. 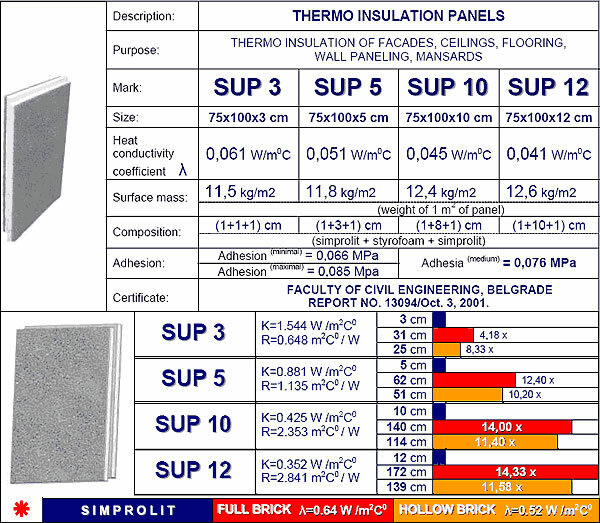 Also, the structure of Simprolit panels is such that it does not allow freezing at seams, and the particular advantage that they have is a possibility of panels being coated with a thin coat of plaster, without placing plaster lath on connections, as separation on seams is prevented by gluing the profiled edges using a simple glue for styrofoam or wood. One of the definite advantages of facade thermo-insulation Simprolit panels is that the finishing work on them can be carried out with any of fasade materials, from those for painting all through to structural coating. The possibility to be particularly underlined is the one of direct glueing of granite facade panels, owing to the high degree of adhesion existing between the styrofoam layer and both od the Simprolit layers. The applicaton of the facade thermo-insulation Simprolit panels considerably reduces the costs of thermo insulation on reconstructed structures and facades of new buildings. Thermo-insulation of outer walls has become an imperative in the present day world, in an era of energy saving and environmental protection. If we decide right away not to consider the building system of double outer walls with thermo filling in between as irrational and costly, particularly on the structures already made, two procedures are customary - to cover the facade with mineral wool or to cover it with styrofoam panels. Both procedures are much more expensive and technologically more complex than using the Simprolit panels on the same facades, particularly if thermically stabilized and weather resistant materials are used, such as the "Rokwool" mineral wool or the "Styrodur" as stabilized and homogenized styrofoam. For example the price of 1m2 of facade with mineral wool panels applied as insulation – after the "SYNERGY" type procedure of facade insulation – is two times higher than the price of 1m2 of facade with the Simprolit panels applied. Finishing work can be done directly on the surface of Simprolit panels, and any material usually used for finishing work can be applied, which is not possible if mineral wool or styrofoam are used as insulation, as a special reinforced mesh must be used after which the finishing work is done with the imported plaster and paint. For insulation of attics, loggias or ceilings below terraces and open spaces, mineral wool or styrofoam must be additionally protected, and that is usually done by means of wooden matchboarding or gypsum-cardboard panels, because of which the surface above must additionally and very carefully be insulated against water, particularly on installation routes, or in the event of their subsequent rework. All this is much easier and much more economical with the Simprolit panels, which can simply be plastered and painted, with no limitations regarding the choice and treatment of the interiors. FIRE RESISTANCE OF "SIMPROLIT PANELS"
Simprolit panels do not burn, there is no smouldering and no flame. Simprolit panel 11,0 cm thick samples, during a 90-minute test determined that on the samples tested the ultimate states are not registered for loss of wholeness, i.e. the monolith nature (E), and also for the loss of their thermo-insulating ability (I) . It is generally known that styrofoam, if not protected against air on both surfaces, would in time evaporate. Besides, the unstabilized styrofoam, particularly in higher temperatures, releases the "styrene" gas which is harmful for human health. The situation is similar with mineral wool – except for the specially stabilized hard pressed mineral wools of "Rokwool" type (whose price is between 125 and 175 USD/ m3), which in time oxidizes, turns into powder and falls to the ground as fine dust, leaving unprotected air pockets behind. Special problem arizes with unstabilized mineral wool (only that kind is manufactured in our market( which is usually thrown over the wooden matchboarding in the attic – in time, after the process of oxidation, it turns into a fine needle-like dust dangerous for respiratory organs, particularly in children. All these problems are easily solved with the Simprolit panels in which the styrofoam is completely arrested between the two layers of Simprolit, polystyrene-concrete with exceptinal quality of physical, chemical and biological characteristics. Partition walls made of Simprolit panels are much lighter in weight than gypsum partition walls made of full gypsum panels, and they conform to all requirements regarding the sound and thermo-insulation. Also, they have many advantages compared with the pre-fabricated partition walls made of two layers of gypsum-cardboard with the mineral wool filling in between. In addition to the environmental advantage, the most obvious advantage of the Simprolit panels is that they can be directly plastered and treated with all, most different finishing materials. Based on the advantages enumerated above, it is obvious that by using the Simprolit panels the Investor would not only save MORE than 30% in funds, but would get a good quality building, in all parameters. THE FULL CORRELATION OF SIMPRO PRODUCTS WITH THE "PRICE-QUALITY" CRITERION MAKES THEIR APPLICATION IN HOUSING PROJECTS VERY PROMISING.